Do you like your milk light and creamy but not too rich? Then Clover Farms 1% Trim Milk (Low Fat) is a great choice. Trim Milk from Clover Farms is low in fat and calories, but still retains some of the rich flavor and creaminess of whole milk. Trim also has greatly reduced cholesterol. Did You Know? If you love milk, it may be one of the healthiest addictions you could have. The protein in low-fat cow’s milk contains all of the essential amino acids your body needs daily. Studies have shown that the protein may help reduce your risk of obesity, boost metabolism, help you maintain lean muscle mass, reduce the risk of osteoporosis, improve blood sugar levels, lower blood pressure and cholesterol, and reduce your risk for developing heart disease. Try some today! 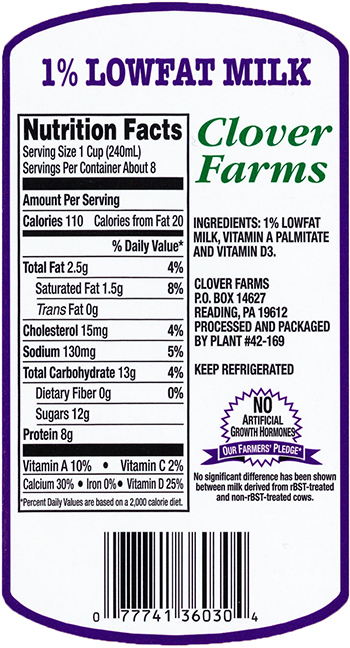 If you’re on a lowfat diet or trying to keep an eye on your saturated fat intake, try Clover Farms 1% Trim (Low Fat) Milk.